Most movies about artists (painters, composers, authors, etc.) tend to be dull and uninspired, rendering the subject of the film far less interesting than his or her work. Amadeus is an exception. In fact, it is arguably the best motion picture ever made about the process of creation and the creator. By electing not to progress in the direction of a traditional bio-pic, director Milos Forman and screenwriter Peter Shaffer have crafted an amazing portrait of Wolfgang Amadeus Mozart, filled with rich details, powerful drama, and a commanding score. Amadeus is an achievement, and was deserving of every one of the eight Oscars it captured on that late March night in 1985. When Forman first heard about Shaffer's stage production of Amadeus, he was reluctant to attend, reasoning that a play about Mozart might be unendurably boring. By the end of the evening, however, he was determined to turn Amadeus into a movie. With the financing in place from producer Saul Zaentz, Forman and Shaffer spent four months writing the screenplay, intending for the motion picture to focus more on Mozart (Tom Hulce) and less on his rival, Antonio Salieri (F. Murray Abraham), than the play. They also fleshed out precisely how Mozart's compositions would be used, since the score would be integral to the story, not just random pieces inserted to instruct the audience about the proper emotional response for various scenes. Amadeus covers the last 10 years of Mozart's life, time that was spent primarily in Vienna. From 1781 until 1791, the film chronicles the composer's triumphs and failures, as viewed by Salieri, the Court Composer to Emperor Joseph II (Jeffrey Jones). Amadeus actually begins in the 1820s, with an aging Salieri, now confined in an insane asylum after attempting suicide, offering his confession to a priest. His tale forms the bulk of the movie's narrative. In 1781, Salieri is in awe of Mozart - until he meets him. A mediocre composer with a limited reputation, Salieri recognizes greatness in Mozart's music, but is horrified to find that the man he admires is a childish rogue who chases women, drinks heartily, and has little or no respect for the manners and morality of decent society. Salieri's repugnance for Mozart grows as he gets to know him and witnesses further acts of degradation. Believing God to have placed his favor upon an undeserving individual, Salieri views the situation as a rebuke from God, and becomes determined to strike back at the Almighty by silencing His instrument. Thus, Salieri plots Mozart's downfall. But, at the same time, even as he seeks to destroy the man, he is held enraptured by the music. Without a question, the most complex character in Amadeus is Salieri. Although only a mediocre composer in his own right, he is gifted enough to recognize true genius when he discovers it, and he finds it in Mozart. To add indignity to injury, Salieri has led what most would consider to be a pious life - avoiding women, shunning drink, and devoting himself to the service of man and God - while Mozart's existence has been one of excess and debauchery. Despite that, it is Mozart's music that reveals God, not Salieri's, and he knows it. He is tortured by this, and his envy leads him to seek Mozart's fall. To that end, he toys with Mozart's mind, even going so far as to trick the dying composer into writing his own requiem mass (which Salieri plans to steal and claim as his own). As depicted in this movie, Mozart is a spoiled child in a grown man's body. Indeed, while he is a master of music, the other areas of his life are stuck in a state of arrested adolescence. Like many modern-day rock stars, he strides heedlessly through the world, expecting it to conform to him, and living far beyond his means. He also displays a streak of cruelty that is borne not of malice, but of idleness (as when he mocks Salieri, not knowing that his rival is present). He loves his wife, yet is unfaithful to her. And he is devoted to his father, and haunted by his memory when the old man dies. The third "main character" is Mozart's music, which suffuses nearly every frame. Forman and Shaffer carefully selected and placed each piece, situating it where it would be amplify the on-screen action. One of the most stirring and memorable sequences occurs late in the film, as Mozart is dictating his requiem to Salieri. Here, we see the act of creation in process, both in the acting of Tom Hulce and F. Murray Abraham, and hear the way the music is utilized. It's a great moment in a great film. Amadeus is not intended to be a rigorously accurate depiction of the historical Mozart. The filmmakers have taken numerous liberties in the name of drama. When developing the play, Shaffer used many real and apocryphal incidents from the composer's life, but his intention was to build an involving story, not to regurgitate the known facts. In fact, there is little in the historical record to back up the assertion that Salieri's bitter jealousy led him to undermine Mozart at every opportunity. For the performance of a career, F. Murray Abraham took home the Best Actor Oscar. The film was Abraham's breakout portrayal, and catapulted him from relative obscurity into the limelight. The way he approaches Salieri is perfect for the role. He portrays the man not as a traditional villain, but as a tragic figure burdened by guilt, jealousy, and the belief that God has abandoned him. Even when Salieri smiles we can see the conflict in his eyes. When he realizes that Mozart is dying, we can feel the tug-of-war between the desire to carry out his plan and the recognition that the world's greatest musical voice is about to be silenced. It was Tom Hulce's misfortune to have been nominated opposite Abraham in the Best Actor category. Had this not been the case, he might have won. Hulce's performance is more overstated than Abraham's, and lacks many of the subtle nuances - but that is by intention and necessity. Mozart is supposed to be larger than life - a great and ostentatious figure. Hulce plays him like an oversized child - an adolescent in a man's body who is as far behind everyone in social skills as he is ahead of them in music. Then there's the laugh (which is based on one woman's account of how Mozart chortled), which Hulce makes sound spontaneous every time. Amadeus was filmed in Prague, because, in 1984, it was one of the few remaining cities in Europe that retained the flavor and architecture of the 18th century. So, without having to build expensive sets, the filmmakers were able to capture the look and feel of Vienna during the days when Mozart walked the streets. The operas depicted in the movie were staged in an old, wooden Opera House that not only existed in the 1700s, but in which Mozart conducted performances. An expanded "Director's Cut" of the film was released in 2002 (primarily for DVD, although it received a brief theatrical run). Approximately 20 minutes of previously excised material was seamlessly re-integrated. Although some of the new scenes have little value beyond padding out the length (such as a campy satire of Mozart's music), others add new dimensions. A shot of Mozart's corpse being dumped into a pauper's grave increases the ending's poignancy. And a subplot involving Constanze's attempts to use her body to curry favor with Salieri makes it apparent why she shows such contempt for him when she later finds him working with her dying husband. 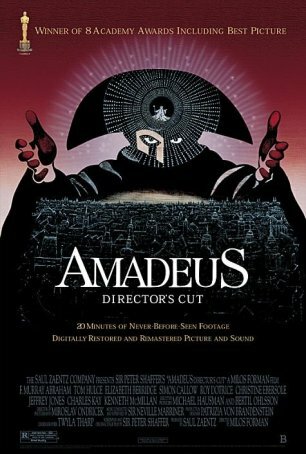 The Director's Cut of Amadeus has been rated R, while the original was rated PG. The only additions that can explain the ratings change are two brief shots of Elizabeth Berridge's breasts in a non-sexual context. How this warrants an R is inexplicable. (There were much longer breast shots in Doc Hollywood and Titanic, and those movies were rated PG-13.) This is as clear an example of the MPAA's lack of consistency as can be found. One might easily ask why the movie was called Amadeus, instead of Mozart or even Salieri. The reason goes to the translation of the composer's middle name. "Amadeus" means "Beloved of God," and this fits in perfectly with Salieri's view that Mozart has been chosen by the Almighty over Salieri. This lies at the root of his destructive envy. Amadeus was neither the first nor the last great motion picture crafted by gifted director Milos Forman. Nine years earlier (also with producer Saul Zaentz), he made One Flew Over the Cukoo's Nest. 12 years later, his The People vs. Larry Flynt became the darling of the critics (and earned Forman his third Best Director nomination). Yet, of all the projects Forman has been involved with, none has striven for and achieved as much as Amadeus. No matter how many additional great movies he makes, he is unlikely to surpass this one. Whether you choose the original 1984 theatrical version or the extended Director's Cut, you won't find a better motion picture depiction of genius, art, and the artist. Not only is Amadeus a fascinating character study, but it also features a tragedy of Shakespearean proportions in the twisted triangle of Mozart, Salieri, and God. No movie before or since has so effectively woven music into the tapestry of the motion picture. Many films treat sound as an adjunct to the visual aspects; Amadeus views them as equals. Lovers of classical music will be enraptured by this soundtrack. Those who prefer Nine Inch Nails and Slipknot will find themselves introduced to a new dimension of music here, and won't be bored or turned off by it in the least. Amadeus is, without question, a modern classic.